As soon as I saw the theme for this month’s Mixology Monday, I knew exactly which drink I was going to choose. I had spied this cocktail as Imbibe Magazine’s Cover Cocktail Contest. Besides looking as downright pretty as a Mardi Gras Indian, it combined two of my favorite beverage-ables – hoppy beer and odd homemade ingredients. 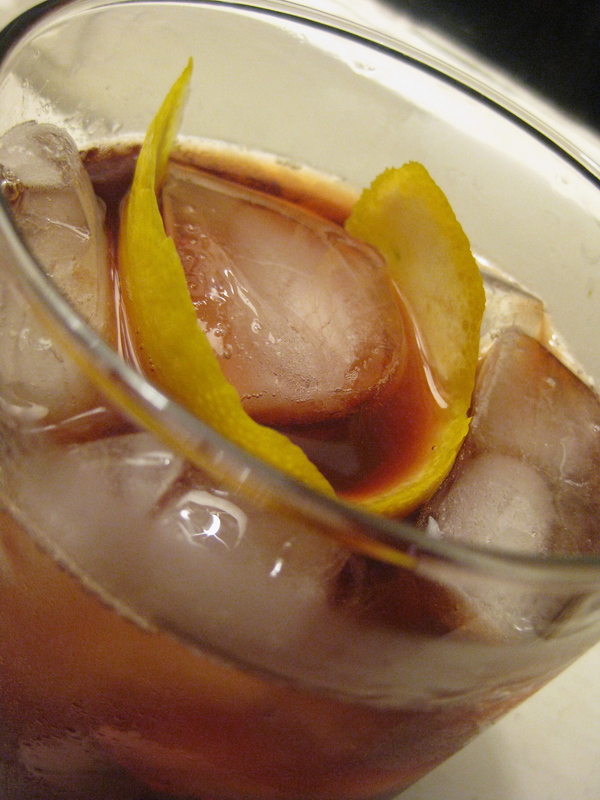 Plus, the recipe comes courtesy of a bartender from Worcester – Woostah! – so with the Masshole connection, how can you go wrong? In addition to a hoppy IPA, this tall one calls for two homemade ingredients. The first involves infusing Pineau des Charentes with Earl Grey Tea. I had never heard of pineau before. Its a fortified wine that comes from Western France, and is a combination of unfermented grape must combined with cognac, which is then aged in oak barrels. I found it light and pleasant when chilled – not very complex, sweet, and easily drinkable, especially on a warm day. I can see why old ladies in France drink it – for some, that might be considered a drawback. But these days, in the era of mass produced lowest common denominator tastes, I’d say old French ladies probably know where its at. Especially when you consider the kids are drinking Four Loko. The second ingredient is a shrub. Shrubs are generally a combination of fruit juice, sugar and either an acid (usually vinegar) or alcohol. Erik at the Savoy Project has a nice run-down of some basics of the two different types. Shrubs go back several centuries. I’ve seen references to shrubs as a pre-refrigeration era means of preserving fruit for extended periods, being used as a summer beverage in the American Colonial period when mixed with water. Regardless, they are a relatively easy way to add an usual twist to a cocktail while giving a shout-out to the historical antecedents of modern day cocktails. It can take a while to get all of the ingredients together for this one, but its worth it. It has a great combination of layers, while going down far too easy on a hot day. You could knock these back like a six-pack of tall boys. Which I guess is appropriate for a beer-inspired cocktail. Combine all ingredients except the IPA. Shake & strain into an ice-filled Collins glass. Top with IPA. 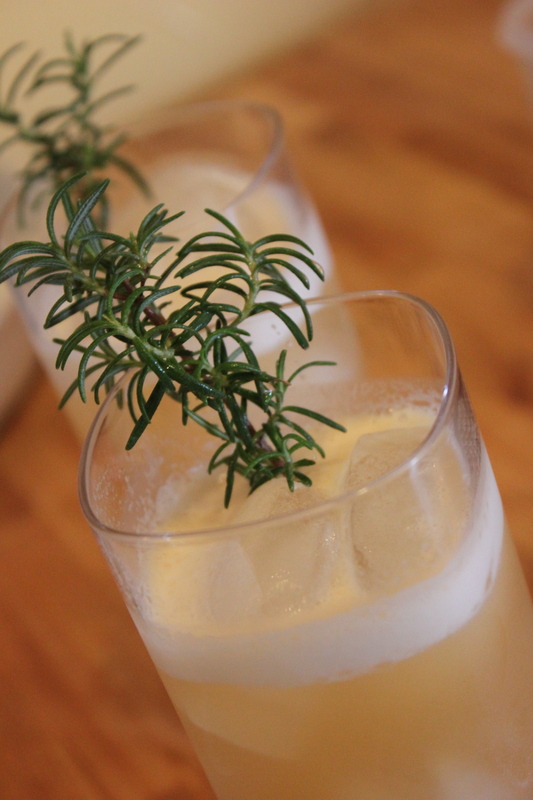 Garnish with pineapple wedge and rosemary sprig. Soak 1 Earl Grey teabag in half a 750 ml. bottle of Pineau for 1 ½ hours. Slice a small pineapple and place in a jar and cover with cider vinegar. Infuse for 4 days, shaking once a day. Filter through cheesecloth and bring 6 ounces of pineapple vinegar to a boil with 5 ounces of sugar. Skim off top layer and add 1 sprig of fresh rosemary. Boil for 10 minutes, remove from heat, filter and cool before bottling. I’ve been completely and utterly lazy about blog posts over the last several months. As often happens, life caught up to me and adding new posts kept dropping to bottom of the “to do” list. Or, at least, that’s the story I’m telling myself. Likely closer to the truth is that new, additional hobbies have been distracting me – like curing my own bacon (for a future blog post), confiting duck (another blog post), or sausage making (and yet another blog post). Home charcuterie – she is a wicked temptress. On top of that, our local independent bookstore has rekindled a reading habit that the dry casebooks of law school had formerly burned out. Scandinavian crime novels being my current fix. As a result, I made this particular cocktail months ago when the whether was colder and damper. The combination of rye, dark rum and port were the perfect cozy drink with a kick to ward off the winter rains. David Wondrich is right when he describes it as calling up the feeling of a musty, old school men’s club, with the scents of leather, oak and tobacco coming to mind. Regardless of the current weather here in the Bay Area, someplace must still need shaking off the last of the chilly winter grays – Seattle, I’m looking right at you. Cheers! Stir with ice and strain into cocktail coupe. Recipe courtesy of David Wondrich. Something about the last week in August always brings a bit of the blues. Labor Day lurks just around the corner, signaling the traditional, if not official, end of summer. The days get noticeably shorter, especially when leaving the office after work to find the sky already darkening. Parents rush to the downtown stores for the last of back to school shopping. The lazy mid-summer baseball season starts heating up in expectation of October playoff races. Vacations wind-down and the next period for extended time off isn’t until the winter holidays. Thoughts turn inward to the meditative and softly melancholy. Appropriately for this change of seasons, Lush Life Productions, the host this month for Mixology Monday, has chosen “Brown, Bitter & Stirred” for its theme. While some folks in Gotham City might disagree, drinks like the Manhattan and Old Fashioned never struck me as year-round drinks. When the days are warm and long, I find myself reaching first for refreshing tall drinks like collins, swizzles and slings, as well as concoctions involving seasonal farmer’s market fare for modern twists. Yet, as the season – and mood – turns, cocktails involving brown liquors, bitters and more brown liquors are just about what I need today. However, as I am not quite ready to completely let go of summer just yet, I’ve taken the traditional Manhattan for a trip to the outer banks of Long Island for the upcoming Labor Day weekend through an infusion of end of summer strawberries and a complementary dash of rhubarb. * Hull and slice one pint of organic strawberries – its important to use sweet, ripe strawberries, otherwise the infusion flavor will fall flat. Infuse in high proof rye for approximately one week. Strain through fine-mesh sieve or cheesecloth, then bottle. Recipe courtesy of Barman Cometh. One of the best things about living in the Bay Area is the year-round access to a seasonal cornucopia, much of it grown organic/biodynamic/grass fed/with hugs. Growing up in the Northeast, the growing seasons were considerably shorter and there was always the miserable stretch from late November until winter was over when “seasonal” vegetables meant potatoes, cabbage, potatoes, winter squash, and potatoes. Everything else was shipped in from warmer locales, picked under-ripe to avoid bruising and spoilage in transit, meaning produce that tasted bland and mealy. Here on the left coast, it is a completely different story. I’d even go so far as to describe it as a complete change of habitat. After a while, you forget that being within a 100 mile radius of farms, vineyards, ranches and fisheries generating year-round produce is NOT normal. You quickly grow used to it. Spoiled even. Not that I’m complaining – the “half the price as the grocery store for three times the quality” daily supply of farmer’s markets is not only key to the good life, but also the lynchpin to saving enough money to pay the insane rents out here. Right now, the farmer’s markets are bursting with string beans, cucumbers, tomatoes, summer squash, golden beets, melons, berries, plums and peaches. It’s that last one that is my weakness – picked just ripe that day and ready to almost burst from its skin, there is nothing like a summer peach. With almost, but not quite too much sweetness, it has the burst of sun-filled flavor that reminds you of long summer days that fade into warm, muggy nights of backyard grilling and homemade ice cream. And like summer, it is also quickly fleeting, with a peak season gone almost as soon as it arrives. Sweet and fleeting, a little bit like life, I guess. So enjoy it while it lasts. Muddle the peach with simple syrup. Add the rye and lemon juice. Shake with ice, strain into a tall glass over ice, and top with club soda. * Depending on how sweet & ripe your peaches, you may need less than 1 ounce of syrup. Next one I’ll be trying it at 3/4 oz. I used drink these a lot in college, back when drinking involved hole in the wall bars in Boston – in the times not only prior to the modern speakeasy, but before Ferris Bueller’s wife ordered her first cosmo. Drinks came in three varieties – beer, shots of straight liquor, or poured drinks that involved combining hooch with either electric yellow “sour mix” or something squirted out of a bar gun. These were not cocktails so much as alcohol delivery devices. Which is a real shame, as the era of the artificial sour mix often has scared people off from some simple, but classic and tasty cocktails. Sours are one of the core types of mixed drinks, from which we get, for example, the Daiquiri, the Sidecar and the Margarita. Booze, fresh citrus and sugar – you can’t get any simpler than that. From that formula, you can easily riff in various directions to add some complexity to your sour. One common modifier to this classic formula is the use of a raw egg white. The egg white doesn’t add any flavors, but it does substantially alter the mouthfeel, giving the drink an added volume and fullness that transforms the drink into something that makes it quite hard to avoid tossing back several in short order. Combine in dry tin and shake to emulsify. Add ice, shake and strain into cocktail glass. Garnish with cherry. There’s a bar in New Orleans built out of an old carousel. Yes, a carousel. You sit on the barstools and they revolve around a circular bar. Because when you are drinking in New Orleans, that’s exactly what you want to be doing – spinning in circles as you get drunk. Regardless of the logic or wisdom of a revolving bar, the Carousel Bar at the Monteleone Hotel does have an excellent house cocktail, dating back to 1938. Like so many classic New Orelans cocktails, it takes brown liquor, bitters and a sweetener – turning the familiar taste of a Manhattan and taking a left turn into Paris. That is, Paris if it was in the middle of a swamp where eating alligators while dancing to crazed accordion music was considered normal. Vive la Nouvelle-Orleans! and stir to mix. Garnish with a stemless cherry. Classics are classics for a reason, but sometimes, you want the familiar but with a bit of a twist. Kind of like when I’m almost but not quite in the mood for the Beatles and instead throw on the Feelies cover of Everybody’s Got Something to Hide (Except for Me and My Monkey). 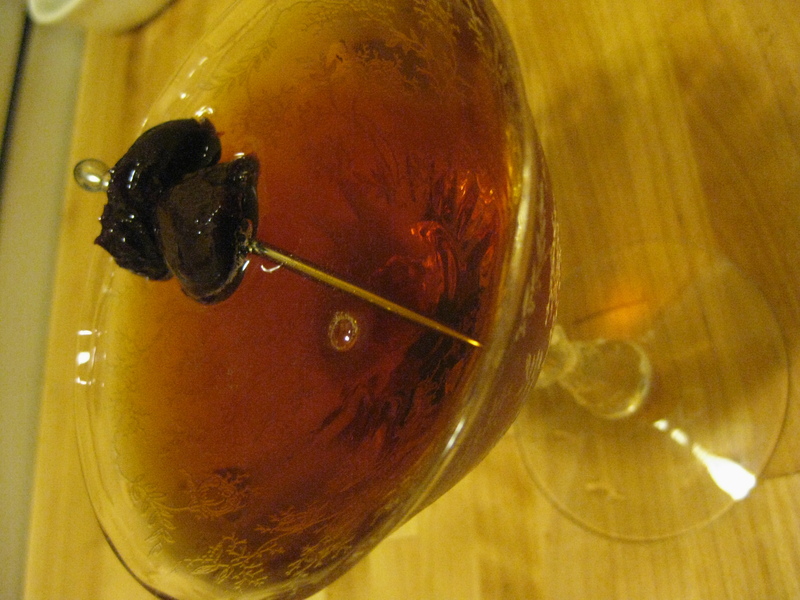 In this case, a “borough” spin on the Manhattan. Some might call it the best borough. It’s a bit like a Perfect Manhattan but with some underlying funk to go with dry/sweet combination. The one ingredient that can involve a bit extra work is the Amer Picon. As I’ve noted before, the current formulation bears little resemblance to the original, which leaves the boozily nerdy with the choice between making your own or using Torani Amer as a (perfectly acceptable) substitute. I went with the former, as I have two big bottles of homemade Jamie Boudreau-version replica to drink through – heaven help us. Sipping this on a Friday evening waiting for Ms. ChinaNob to return from debauchery “work conference” in New Orleans got me thinking: New York gets all these variations on the Manhattan: the Brooklyn cocktail, the Bronx cocktail, Audrey Sander’s Little Italy, Enzo Errico’s Red Hook, the Greenpoint and Besonhurst…but what do we get in the Bay Area, a veritable ground zero for cocktail drinking ever since the Forty-Niners found gold in them thar’ hills? A practically lost recipe for bar brawl inducing punch that involves both an odd Peruvian brandy, pineapple and gum arabic?!?! I love me some Pisco punch, but its not exactly a tipple I often find myself wanting after the end of a long day at the office. Where is our Nob Hill, Pac Heights, the Mission, the Tenderloin, Jack London, or OakTown? Seriously, wouldn’t “The Panhandle” be a great name for a San Francisco cocktail, capturing in its name both our postcard pretty famous park as well as the modern day mendicants of our more gritty ‘hoods? Harrumph. Stir with ice and strain into cocktail glass. Garnish with orange peel. Recipe courtesy of Oh Gosh! I think the paths of obsessive cocktail geekery eventually lead all to the same point. Namely, after you’ve fully rounded out your home bar to the point where you frighteningly have individual shelves for your ryes, rums, gins and so forth, you find yourself daydreaming about making your own booze – or the closest thing thereto. While California’s cornucopia provides options like Meyer lemon, Buddha’s Hand citron, or Seville orange for some kick in the pants limoncello, there is quite a lag between initiation and gratification. So while waiting for the two month soak of my orange tincture to finish for a batch of DIY Amer Picon, I decided to experiment with summer strawberries. The Ferry Building Farmer’s Market is always a go-to place for the frou-frou-est in fresh organic produce. One of my favorite vendors is Swanton Berry Farm near Santa Cruz. In addition to growing some of the sweetest, tastiest, juiciest California Certified Organic strawberries on the planet (and the best strawberry jam I have ever tasted), they also get mega-kudos for being the first organic farm in the country to sign a labor contract with the United Farmworkers of America AFL-CIO. Tasty berries and labor-friendly to boot! I took a pint of Swanton’s berries, sliced them and put them in a jar with a bottle of Rittenhouse Bottled-in-Bond 100 Proof Rye Whiskey. The berries did battle with the R100 for a little over a week until the red in the berries had completely leached out leaving the fruit a ghastly white. It was actually quite cool looking. I strained the liquid a few times in cheesecloth to remove as much of the loose organic matter as possible and bottled the now cherry red colored whiskey. Needless to say, it tasted like a summery, boozy strawberry pie. Combine rye, vermouth and bitters with ice and stir. Strain into glass and garnish with orange peel and strawberry slice. Some nights you just need a classic. Martini, Old Fashioned, Daiquiri, Aviation, Manhattan… Tonight was a good night. Got into the office early at eight before the phones started ringing, even got hit sideways after lunch with a firedrill project – those projects you get when its 2 PM and you are told it needs to be finished by the next morning or else. Took it all in stride, logged a good productive 10, and called it a day. Even mangaged to gobble down my lunch in 10 minutes so I had time to run across the street to the booze nerd liquour store. 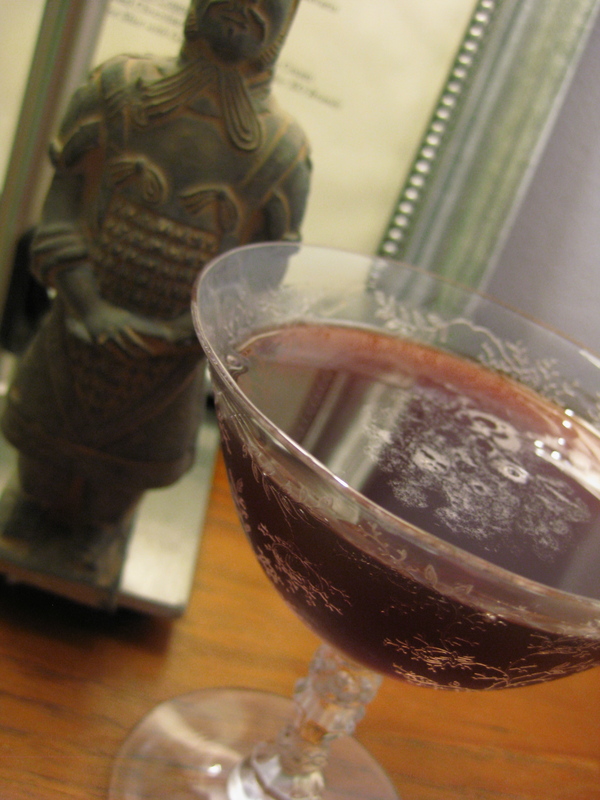 I had recently discovered that vermouth – as a fortified wine – spoils. Not as quick as regular wine, since it IS fortified, but it will spoil. Especially if you don’t know this and leave it in your liquor cabinet and neglect to use it because you are too enamoured with your other recent booze purchases. Ahem. Way too old vermouth = N.A.S.T.Y. Doing some research (AKA seeking the Oracle at Mountain View), it turns out that the best means to prolong your vermouth is to treat it just like wine. This means reducing oxidation – whether with a wine pump or injecting inert gas or the simple decanting to a smaller bottle. Refridgeration also helps as well – combined with reducing the air in the storage bottle, it can take a shelf life of a month or two and prolong it up to six months. Of course, drinking more frequently is another method! This whole ramble is just prologue to an excuse to splurge a bit and pick up a bottle of Carpano Antica, the original sweet vermouth, which I had been dying to try. It sure as heck looked fancy. Came in a metal tin. Big heavy glass bottle. Even had a foil seal with a cork. Boo-zwa-zee. And the taste was 100% whoa – not too cloying sweet, orange peel scents, herbal, long finish. Drinkable straight, on ice, with a little orange twist. OK, Italy – you win. You know how to make an aperitivo/digestivo. All of which meant that what I needed at the end of this day, for vermouth this tasty, was good old American rye whiskey. Stir with plenty of ice. Strain into cocktail glass. Garnish with homemade brandied cherry. Because you can. Stir with plenty of ice & strain into cocktail glass. Garnish with lemon twist.